Ah Luminous Arc…I own you, but I never played you. I wanted to, I really did, but there are just so many games and so little time. Now I have to deal with Luminous Arc 2, because it comes with a CD and for some reason I feel extremely compelled to buy games that come with a soundtrack. 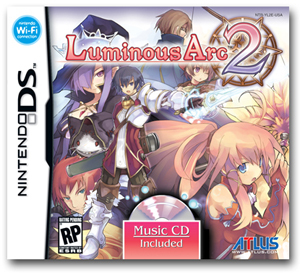 Luminous Arc 2 will be out for Nintendo DS™ this holiday season! We know, we know… We’re on a roll. Sporting a more refined interface, rebalanced strategy features, responsive touch controls, and many more improvements, Luminous Arc 2 provides a gaming experience that builds upon the success of the original in every way. Also, every single copy of the game will include a soundtrack CD, all packaged together in a lovely (slightly) oversized box.